OTTAWA, May 18, 2017 – The potential of the Ring of Fire, a large-scale mineral deposit in Northern Ontario, to bring prosperity to Indigenous communities remains trapped under a simmering conflict. Heather Hall and Ken Coates, in a paper for the Macdonald-Laurier Institute, chart a path forward for the Ring of Fire and mining in Northern Ontario. 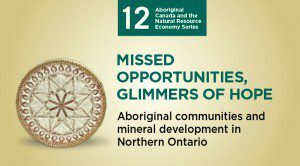 To read the full paper, titled “Missed Opportunities, Glimmers of Hope: Aboriginal communities and mineral development in Northern Ontario”, click here. There are positive examples to draw on, including the approach used by the Wabun Tribal Council to prepare communities for engaging with development. WTC has negotiated roughly 50 MOUs and exploration agreements and at least 5 Impact and Benefit Agreements over the last 10 years. “Northern Ontario faces a major test in the coming years as it seeks to put the acrimony and uncertainty of the past behind it and forge the new relationships needed to provide opportunity for all in one of the most important resource regions in the country”, write Hall and Coates.